This book affects on the importance that makes the sense of the tact in our perceptive experience of the space and in our comprehension of the world, but also it tries to create a species of conceptual short circuit between the dominant sense of the sight and the sensory modality of the tact, the latter suppressed in the perception of our environment. Close to the critique of the hegemony that has had the vision in the history of the architecture, this study reconsiders also the essence itself of the sight. All the senses, included the sight, are prolongations of the sense of the tact; the senses are specializations of the cutaneous fabric, and all the sensory experiences are manners of touching. Our contact with the world takes place in the bordering line of me, across specialized parts of our surrounding membrane. “In short, which I propose is that the psychology of the human mature being consists of a process of development, emergent, oscillating and of spiral marked by a progressive subordination of more ancient systems of behavior and of minor range towards more new systems of a top range as they change the existential problems of the man “. 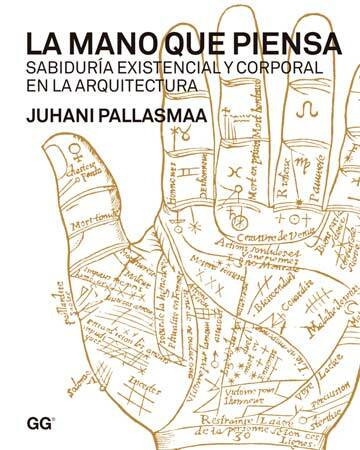 Juhani Pallasmaa (Hämeenlinna, Finland, 1936) is an architect and is employed at Helsinki. He was a teacher of architecture in the University of Technology of Helsinki, the director of the Museum of Architecture of Finland and teacher invited in diverse schools of architecture of the whole world. Author of numerous articles about philosophy, psychology and theory of the architecture and of the art, his work The eyes of the skin. The architecture and the senses (Publishing Gustavo Gili, Barcelona, 2006) has turned into the classic one of the theory of the architecture and is of obligatory reading in different schools of architecture of the whole world. Pallasmaa is also an author of The Architecture of Image: Existential Space in Cinema (2001), Encounters. Architectural Essays (2005) and An architecture of the humility (2010).